In our opinion, having an understanding of safety retirement is important for a workers' compensation attorney. Many workers' compensation attorneys do not understand how CalPERS retirement is impacted by workers' compensation injuries. 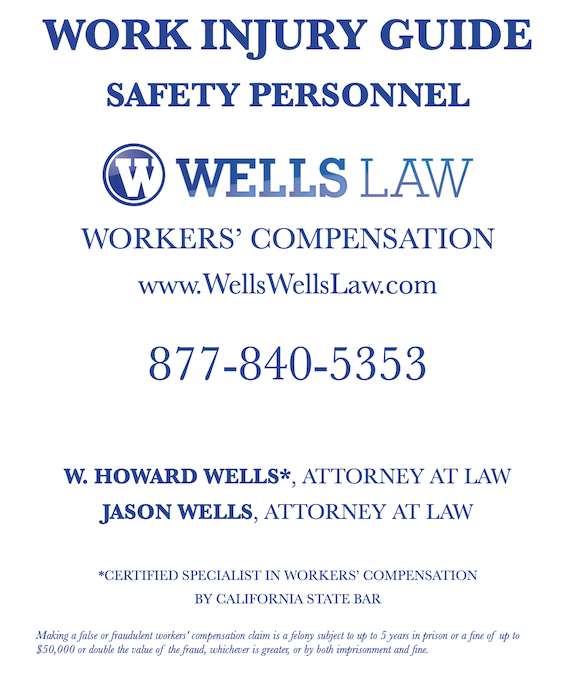 We are not retirement benefit attorneys, however, we feel it's important for your workers' compensation attorney to understand how safety retirement "fits" with workers' compensation especially when you are in need of and eligible for Industrial Disability Retirement (IDR). The primary benefit of IDR is that the first 50% of monthly gross earnings is non-taxable; in another words, the first 50% of your retirement is non-taxable. If you are have one or more work injuries that causes you to be unable to perform your essential job functions, then IDR is a consideration. Industrial Disability Retirement is available to most safety workers who sustain one or more work injuries which render the employee "substantially incapacitated from performing the usual duties of his or her position." The primary benefit of IDR is the first 50% of monthly gross earnings is non-taxable; in another words, the first 50% of your retirement is non-taxable. If you are have one or more work injuries that causes you to be unable to perform your essential job functions, then IDR is a consideration. CalPERS has a worksheet that you can fill out and request an estimation of what you your retirement would be for Service Retirement, Disability Retirement, and Industrial Disability Retirement. If you have a disability that keeps you from performing your essential job functions and that disability is not caused by a work injury, you have been employed at least 5 years, and that disability is NOT caused by a work injury, then you might be eligible for Disability Retirement (DR). Disability retirement is taxable. This is an important distinction in understanding PERS options for disability retirement. Important Point #1: A disability not caused by work means a disability that was caused by something away from work. If you are deemed eligible for Disability Retirement for a disability that you feel was caused by work, and you were approved for Disability Retirement but denied IDR, then read the section below: "Disability Retirement Approved; IDR Denied"
Important Point #2: Donâ€™t assume your disability isnâ€™t work-related. If itâ€™s due to a heart condition, you now know your heart condition is presumed work-related. If itâ€™s an orthopedic condition, i.e. back, your back problem could be due to your work activities. Ask an attorney about whether your disabling condition could be due to your work. Assuming you have reached the minimum age for your position, and you have the required number of years of service (normally five years), you may apply for Service Retirement. Service retirement is available to all who have the required time; obviously, the amount of time put in increases your monthly retirement benefit. CalPERS has an option to those who are applying for IDR and who are separately eligible for Service Retirement. The advantage of applying for Service Retirement Pending IDR is that Service Retirement can be approved in a very short time (usually a few weeks). This is important because an IDR application can take six (6) to twelve (12) months depending on the work load of the CalPERS department that handles IDR. So, you can collect Service Retirement while you are awaiting for the IDR application process. Assuming IDR is approved, your IDR benefits are retroactive back to when you applied for IDR. The disadvantage of applying for Service Retirement Pending IDR is that normally when you request Service Retirement, you are giving up your job for retirement. If you aren't approved for IDR, then you cannot automatically return to your job; reinstatement is required, and this does not happen in every situation. Service Retirement Pending IDR can be ideal for people who know they are not returning to their jobs, however, a disability retirement attorney may recommend you file Service Retirement Pending IDR. At the end of the day, you may want to speak with a disability retirement attorney; we are only workers' compensation attorneys, however we can make some recommendations on attorneys who handle those kinds of cases. If a CalPERS letter or any other communication determines that you are substantially incapacitated from performing your usual dutiesand finds you are eligible for Disability Retirement, denies IDR or will not make a determination for IDR, if the disability you have in your mind is caused by work, then you should take legal action immediately. If you get a letter stating that your Disability Retirement is approved, then contact an attorney immediately. Approval of Disability Retirement can be deceiving especially if your disability is caused by work. Many people don't realize work caused all or part of their disability. For example, if you are a safety employee and you have heart trouble, don't assume work didn't have anything to do with it. If you get a letter stating that your Disability Retirement is approved and work caused all or part of the disability, then it's likely your workers' compensation claim is denied or you might have a workers' compensation case that you are not aware of. Our recommendation is that you should contact an attorney immediately. Failure to take action could bar your rights forever.